I don't know if frugal is a forgotten word, but I know that being careful with money is important to me. Not only that, but I am always pleased when those ideas/savings, no matter how small, work well. This tip is one that has bothered me for a long time. I have a PE700 that is my work horse and I treat it like my first born! The spooling system on the machine is not the best for the thread. 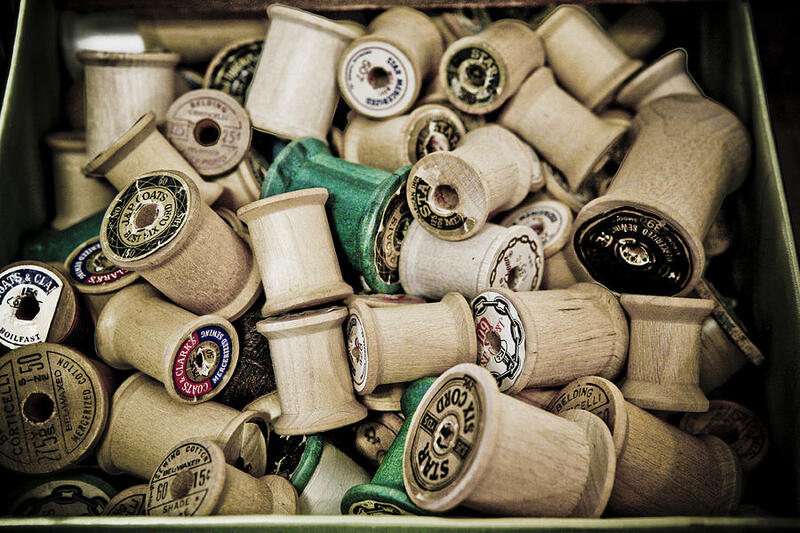 These types of spools are meant to be used with the thread coming from the top. Using a thread stand is the optimum method for this of spool. When in doubt, look to how the commercial machines do it!! If you don't have a thread stand, this one is a tip that I have needed for a long time. I do use my thread stand, but occasionally for different reasons, I just place the thread on my machine. Those spool caps that are given with the machines are a nuisance to me. They often trap the thread, even when I use the cap much larger than the spool, and cause a thread break. I decided on using some adhesive ‘dots' that I got at the $1 store. 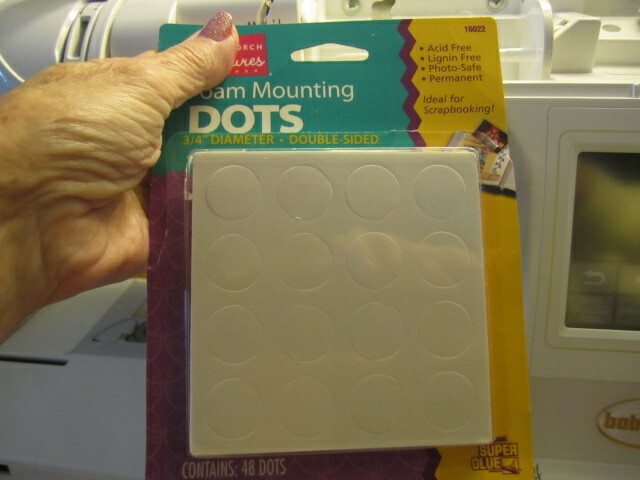 These are for scrapbooking and have a very good bonding agent. I place them on the back side of where the spool resides and it works perfectly. 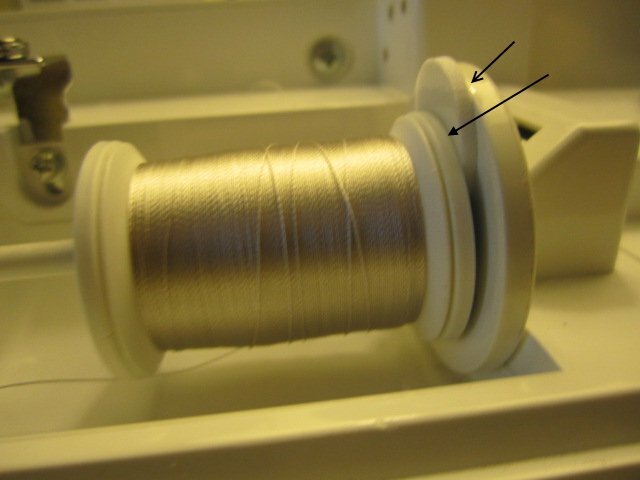 You don't have to have a large amount of ‘hold' because the only pull is from the thread leaving the spool. It stayed sticky for about 6 to 8 spools and replacing it was not difficult. I use a little alcohol to loosen the paste and it is gone. It may look good for a photo but the needle has likely split some of the thread, in the above case, as many as a dozen splits. 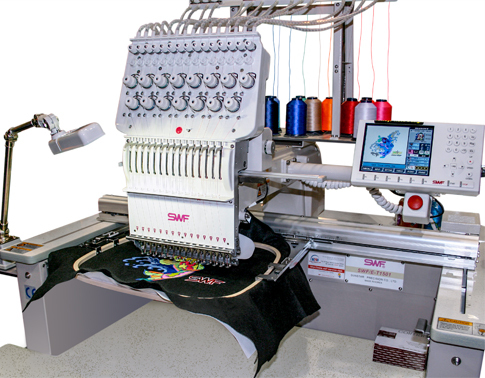 Additionally, the pressure placed on the thread behind the needle has caused flattening of spots on the thread for multiple layers. Again, damaged thread can be a problem on any sewing project. The thread is old and likely to be very dry and brittle. The thread has been subject to improper care such as being in a box of threads where they were laying like the first photo above. Pressure on thread is not good. 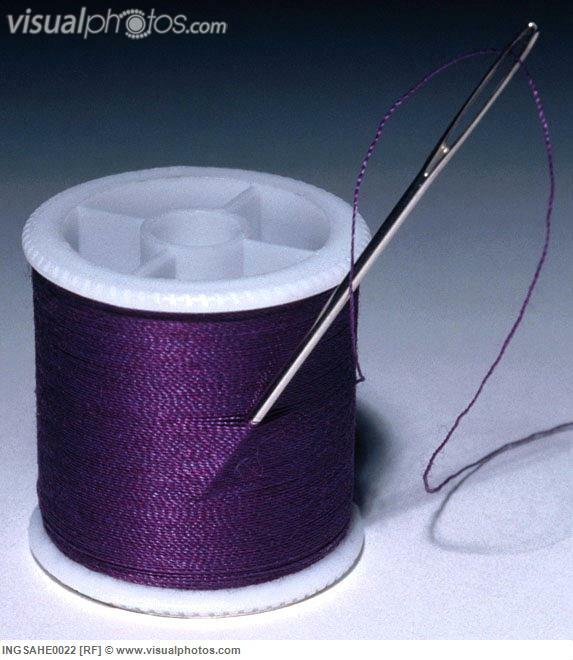 The thread may be ‘off' colors that are not selling or badly dyed and possibly have unreliable coloring. These issues are not necessarily bad, after all, if you need something of an unusual color or perhaps some shading, these may well be great for your projects. 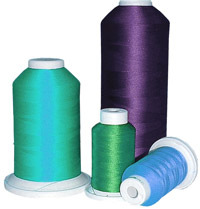 Thread is an expensive investment and care of it will make your projects as good as you expect them to be. Due to a technical issue, the last blogs of AnnTheGran, a great blog on stabilizers, and my last blog, on using the lowly straw to organize all those little items in your sewing room and beyond, was possibly not delivered to your email. Check them both out, you will learn a few things! 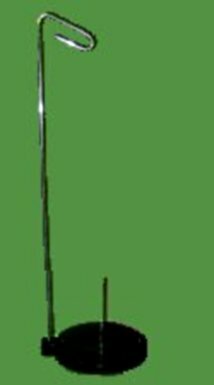 Some of those single thread stands have a lightweight base and can tip. This can be remedied by placing a couple fabric weights or washers (wipe them before using) from the hardware store over the upright and down onto the base. You are right Pattiann, I got one that could be a part of a kite it was so light weight. I did not think of putting something on it. My machine has thread pins that can stand vertically as well as horizontally. The vertical position works well with newer thread spools. Also, non-acetone nail polish remover (recommended for use with acrylic nails) would work well for getting rid of stick residue. I use it to wipe up smudge marks on my hoop or machine left by adhesive stabilzers. I miss the purpose of the sticky dot. What is it doing for you and how? Kelleypoulos - it is a double sided sticky. It holds the spool back from sliding around on the spool holder. If your machine has a configuration that works for you, stay with it. This idea is for thread that may become unstable. I know that I have that issue, thread that gets stuck, but most of you may not. I have had this issue on all my machines and different manufacturers of thread.